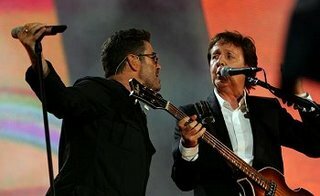 A previously unreleased duet between George Michael and Sir Paul McCartney will finally see the light of the day on a forthcoming greatest hits album. Michael's Twenty Five collection is scheduled for release in November (06) and will feature the McCartney track Hear The Pain. The Careless Whisper singer's greatest hits collection, which comprises hits from his Wham! and solo career, will also feature a song recorded exclusively for the album called Understand. George Michael began his full European tour in Barcelona last Saturday (23SEP06) - his first series of live shows in 15 years.